Outer Dims 26" x 38" x 47"
Anest Iwata was the first in the world to develop air-cooled, oil-less scroll compressors. Multi-stage control is adopted to supply compressed air with an optimal number of compressors. The system may be configured flexibly using SLP compressors alone or a combination of different compressors. The system may contain two to eight compressors and motors. Multi-stage control is adopted to use an optimal number of compressors according to the amount of air used. 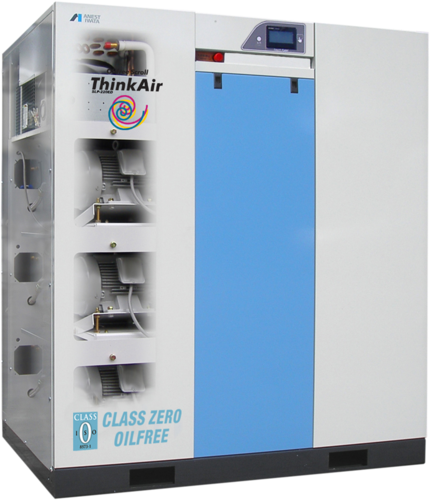 The Think Air Series compressors eliminates wasteful operation to save energy. The touch panel displays various kinds of information such as the operating status and periodical maintenance alerts.